Breakfast on board. Cross to the West Bank to visit the Valley of the Kings, the Temple of Hatshepsut and the Colossi of Memnon.Excursion to the Necropolis of Thebes, on the Eastern bank. Crossingthe Nile, drive to the Valley of Kings; visit the tombs of various Dynasties, The Temple of Deir El Bahari. On the return journey stop atthe Colossi of Memnon which are two gigantic sitting statues representing Amenopis III facing the Nile. Then visit the Temple ofQueen Hatshepsut. Lunch on board. Afternoon free at leisure. Afternoon Tea. (Optional) 65 $ P.P visit The East Bank - Luxor & Karnak Temple Excursionto the Luxor Temple to see its courtyard and the granite statues ofRamses the Great Proceed by carriage or bus to Karnak, which is aserious of temples, built in different reigns. Starting by the Avenueof Sphinxes visit the Unfinished Propylon, the Hypostyle Hall with it's134 gigantic columns, the Obelisks of Queen Hatshepsut and TutomosisIII, the temple of Amon adorned with lotus and papyrus designs, theGranite Scarbeus of Amenophis III and the Sacred Lake. (Optional) 75 $ P.P Hot Balloon:Should you want to make your stay in Luxor an unforgettable. Drifting peacefully over the Valley of King, Valley of the Queens and the Mountain on the Nobles. Overnight in Luxor. Dinner & Overnight in Hurghada. (Optional) 70 $ P.P Departure from hotel about 08:00. Departure from the port at 09:00. Arrival at the Island of Giftun spending 1 hour near The Reefs and 2 hours on the island. Included in this trip: lunch / soft drinks / mineral water / equipment.Overnight in Hurghada. Breakfast.Transfer to the domestic airport. Departure by plane to Cairo. Arrival,meet & assist by our local representatives and transfer to thehotel, Check in. (Optional) 70 $ P.P start your full day tour visiting Sakkara. Then the cemetery for Memphis,used continuously for 3,000 years. See the earliest monumental stone Structure in Egypt, a stepped pyramid built for King Zoser (c. 2650 BC).Then visit the Old part of Cairo, as Egypt was one ofthe first countries to embrace Christianity. We visit the Church of Abu-Sergah and St. Berbara. The hanging Church, We will also visit theold Jewish Ben Ezra Synagogue. (Optional) 50 $ P.P Sound and light show at Pyramids area. At 9:00 am Pickup from your Hotel in Alexandria by Our expert Licensed Tour guide then start your Full Day tour visiting the best sites in Alexandria Start with New library of Alexandria the biggest library in the world now with 8 million books, Site of the ancient lighthouse it's one of the seven wonders of ancient world, Palaces of Farouk, last king in history of Egypt. Then Visit The Catacombs. Dates back to 3rd century its mixture between Greek, Roman, Egyptian art. Then stop for lunch in best sea view restaurant in Alexandria Based on Full Meal for each Person but Beverages are not included. After lunch Visit the Modern monuments Such as unknown soldier of Alexandria, the statue of Alexander the great, drive along the Cornish to see the whole city passing over bridge of stanly land mark of modern Alexandria then at 16:00 drive back to your hotel. and pick you up at 12:20 PM to the airport and assist you at the airport through final departure formalities. 3 Nights hotel accommodation in Hurghada on half board basis. 2 Niights hotel accommodation in Alexandria on Half board basis. 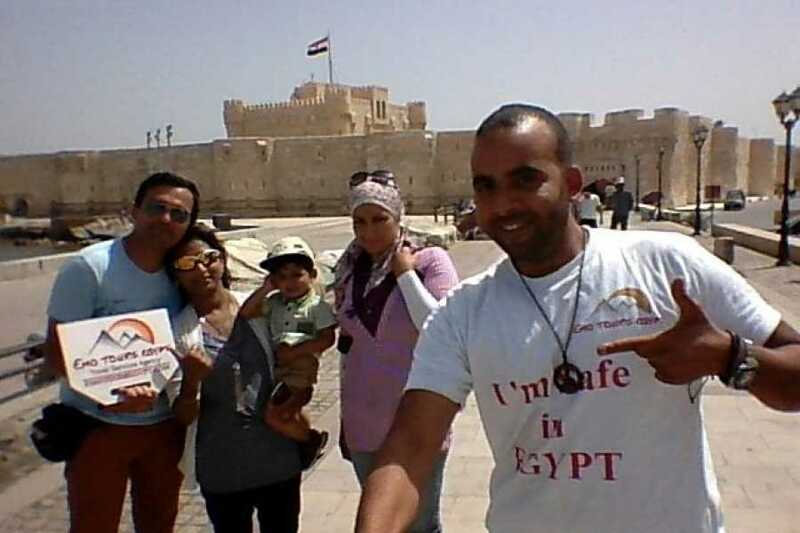 2 Full day tour and 1 half day tour in Cairo . 1 full day tour in Alexandria.